Cuchara was home to settlers who found the soil ideal for growing potatoes. In 1908 George Mayes and his wife moved here and decided the valley was ideal for a summer resort and modern Cuchara was born. The Cuchara Valley Resort offers many winter activities, including downhill skiing. La Veta, settled in 1862, began when Colonel John M. Francisco and his partner Henry Daigre build a fort here for commerce and protection. Threats from Native Americans managed to be resolved without bloodshed and the town survived with the coming of the railroad. 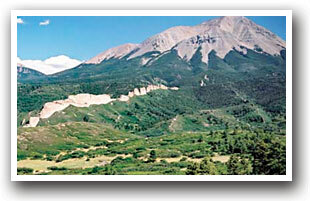 The town of La Veta, located North East of Cuchara, was once a vital life source for the area. Translated as "The Vein," La Veta provided the area with a trading area, supplying area with supplies. La Veta is home of the Historic Fort Francisco Museum built in 1862. The nine buildings on the site were formerly the site of an adobe trading post, and now housing many collections of furniture, tools and clothing: Open Memorial Day - Oct 15th. The Scenic Highway of Legends (Highway 12) was designated as a Colorado State Byway in 1987 and a National Byway in 1988. Like its name, the highway passes through numerous towns which played a part in forming Colorado's fascinating historical legacy. Monument Lake is nestled among the pines and high altitude lakes. A legend here tells of two Indian chiefs who, in search of water for their thirsty tribes, met and embraced in peace, crying for the lack of water. A lake formed at their feet and a volcano erupted, enclosing the two chiefs in rock in the center of the lake. Today both this lake and nearby North Lake offer fishing and other year round outdoor activities. It's been over 50 years since passengers have traveled this historic pass over the Sangre de Cristo Mountains between the towns of Alamosa, Antonito and La Veta. Steep grades and cliff-hanging curves await you. Once the rail hub of the region, Alamosa is the departure point for Colorado's newest scenic railroad!